Almost exactly a year ago I was headed out to Michigan for the opening of my traveling exhibition Unbroken Thread at the Saginaw Art Museum. 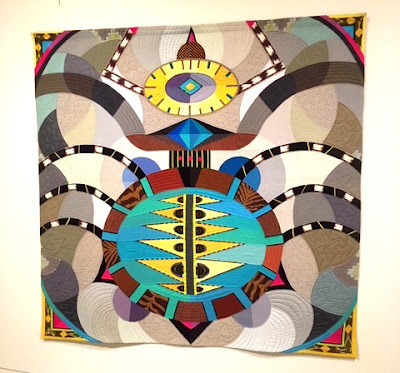 The show had been organized by the University of Maryland University College and traveled to eight art museums and art centers around the country from 2008-2012. 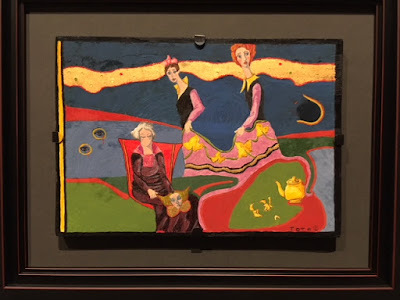 When I arrived at the Saginaw Museum I was delighted to find the curator had hung along side my work some paintings from the museum's Permanent Collection to establish some historical background. 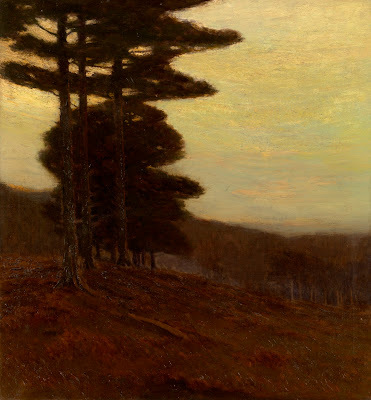 Two pieces were by an artist I wasn't familiar with, Charles Warren Eaton (American 1857-1937). Here are two other of Eaton's oils. I find them very beautiful. And they're kind of radical in the way they force the issue of large flattened out silhouettes being the focal point of the painting. 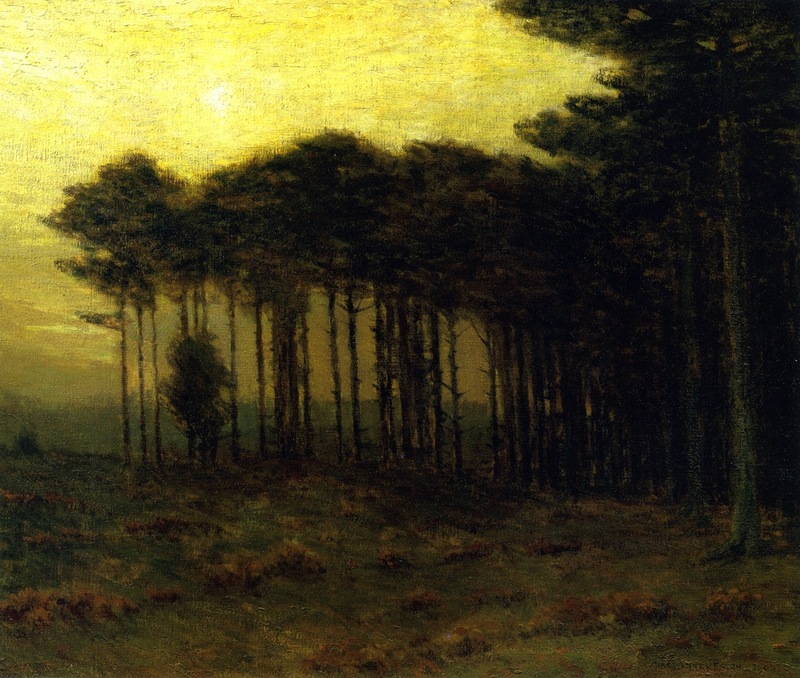 Both paintings here are of pine trees. But as for the composition and energy of the big flat shapes it's hard to image them being more different from each other. Without meaning to, as I was looking at these two romantic paintings I felt myself drifting back in time to 1967. I was taking my first painting classes at Oberlin College in Ohio. The classes were small, in fact only 2 other students came and ever did much in the way of painting. One of them was a year older than I and knew much more about art history. And she loved to talk. Her passion was the work one of the famous abstract expressionist artists, Franz Kline. I felt completely drawn in by her bubbling enthusiasm as she'd expound about how his paintings made her feel, all the while stabbing the air with her lit cigarette for emphasis. (She was a chain smoker and back then people smoked in class, something I don't miss). I can hear her even now "Kline, he can MOVE. He ATTACKS his canvas. He's got the POWER!" She was a little theatrical but she had a point. Here below is old Franz posing with one of his huge paintings. To be honest, I think I learned quite a bit about seeing from my classmate's passion for Kline. His work was fun to look at. His huge brushstrokes whisked your eye across the canvas first one way and then another. I realized there was a lot of drama possible, even if one limited oneself to just the skating back and forth over the surface of the canvas. When I was first picking up the paintbrush Kline been gone for only 5 years. Though he and his fellow abstract expressionist painters were still extremely popular in the art world, they were beginning to give ground to some new painters like Frank Stella and Kenneth Noland who painted smooth geometric shapes with acrylic paint and masking tape. Not wanting to be left behind, I hurried to the hardware store and stocked up on rolls of masking tape. Fast forward back to last December at the Saginaw Art Museum and my seeing Eaton paintings for the first time. I spied them from a distance and was struck by the simplicity of their basic composition. 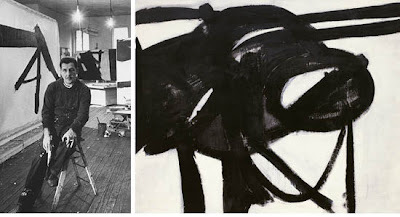 From across the room the "big, bold, and simple" energy I'd once found in Franz Kline all but shouted to me. 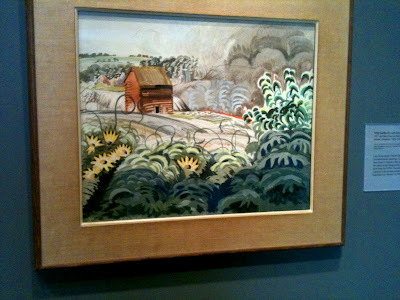 Sure, when one came closer you could see the way Eaton was a very different painter. He wanted not just the energetic flat design but a deep space and a palpable colored atmosphere too. It's funny to think of myself being influenced by both the likes of Franz Kline and by long gone 19th century landscape painters. Was Kline's work directly shaped by Charles Warren Eaton? Not likely. 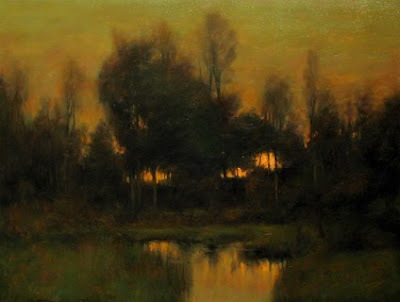 But moving the hand of all painters are their memories of how other artists they've seen before have made them feel. Kline and Eaton are just two links on a long chain of art by those who've come before us. We artists are like sponges, letting ourselves be influenced by all sorts of excitements and delights we've seen in the work of others. "The past isn't dead. It isn't even past" according to Faulkner. Thinking about these Eaton landscapes and the old friend from my college days and her passion for Kline, I know what Faulkner meant. As long as we're thinking about the ghosts we carry with us from the past, let me close with this wonderfully spooky last oil by Eaton. Some of the major pieces that were traveling the country in the Unbroken Thread show will be shown in New York for the first time at George Billis Gallery's solo show of my paintings December 11 - January 19, 2013. 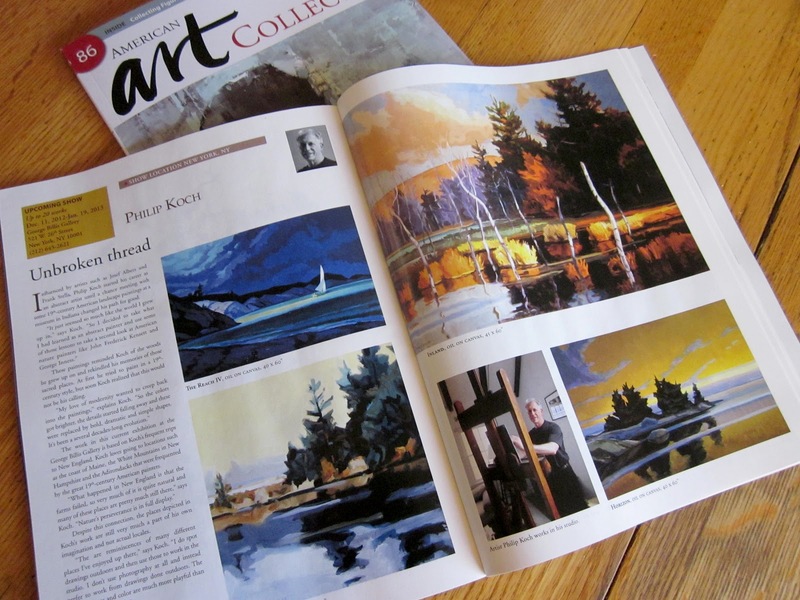 Here's the article in the December issue of American Art Collector magazine about the Billis Gallery show. I discovered Charles Warren Eaton about a year ago and have since picked up a small Easton painting at auction. His scumbling with warm over cools colors, and cool over warm colors was wonderful. Don't go promoting him too much or I won't be able to afford any more of his work! Bravo Philip - on your paintings and your insights. Rob, well Dennis Sheehan did a nice job on it! Great read, Im pleased to own the twin painting to this Sheehan.